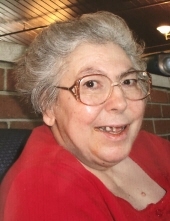 Louise M. Pesenti, 81, of Toluca, IL passed away Thursday, January 30, 2019 at 11:54 p.m Central DuPage Hospital, Winfield, IL. Mass of Christian Burial will be 11 a.m. Monday, February at St. Ann’s Catholic Church, Toluca, IL with Franciscan Friars officiating. Burial will follow at St. Ann’s Cemetery, Toluca. Visitation will be one hour prior to the service at the church on Monday. Memorials may be made to the church. Calvert-Johnson & Froelich Memorial Home, Toluca is assisting the family with services. Louise was born March 28, 1937 in Toluca, IL the daughter of Paul and Josephine Stablum Pesenti. Surviving are one sister Mary Anne McGowan of Oak Brook; and one brother Paul Pesenti of Hewlett, NY; and her nieces and nephews. She was a member of St. Ann’s Catholic Church, Toluca where she enjoyed singing in the choir. Louise graduated from Toluca High School and worked at the Toluca Garment factory for 40 years as a presser. She was a beloved daughter, sister, aunt and friend. "Email Address" would like to share the life celebration of Louise M. Pesenti. Click on the "link" to go to share a favorite memory or leave a condolence message for the family.